Can’t decide on the perfect package? 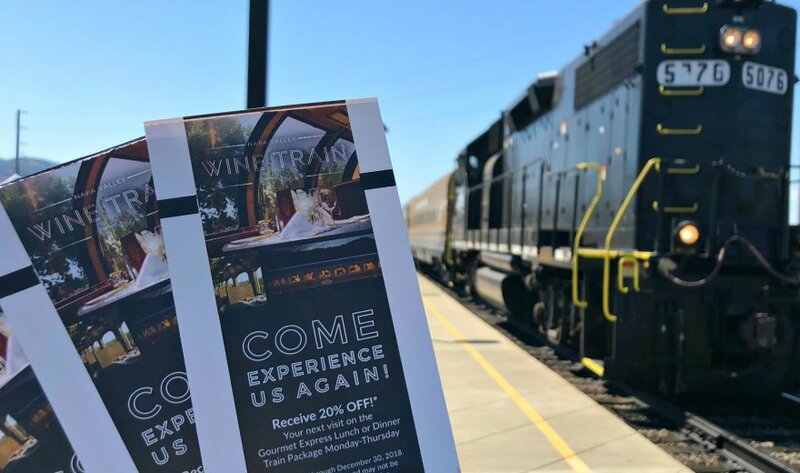 The Napa Valley Wine Train makes the perfect gift! An elegant setting. A stunning journey through a lush vineyard-covered landscape. Gourmet California cuisine and private label wines. A one-of-a-kind experience in one extraordinary package. There’s no more thoughtful gift than one that lasts forever with a lifetime of memories. And a journey on the Wine Train is one you never forget. Crisp linens, gleaming silverware, and sparkling glass served in the exclusive ambiance of our elegant 1952 Pullman full dome railcar. Stylishly restored with Honduran mahogany paneling, brass accents, etched glass partitions, and plush armchairs, the Wine Train evokes the spirit of luxury rail travel in the early 1900s. A Wine Train journey is so much more than a tour or an excursion. It’s an unforgettable experience. Choose a Dining Journey for lunch or dinner. Or take the adventure a little further with one of our Day Trippers, and explore some of the region’s finest wines with tastings and tours of select Napa Valley wineries. In a place that’s known for extraordinary dining experiences, Wine Train journeys really stand-out.